Animation experienced a huge revival during the 1990s for several reasons. The main reason was that Disney re-ignited enthusiasm for the art form with the wild success of the 1989 animated feature film "The Little Mermaid" and a succession of ever-more-popular animated feature films. These included "Beauty and the Beast," "The Lion King," and "Aladdin." As a result of this staggeringly successful output, the decade became known as the Disney Renaissance. However, opportunities in the animation field also were arising due to advances in computer animation software that made it easier for others to craft quality work. Potential heavyweights in the field, such as the folks behind DreamWorks, led by former Disney honcho Jeffrey Katzenberg, were watching closely. They saw an opening develop in the animation feature film field due to the public's renewed receptiveness to quality animation and the new software tools to capitalize on that popularity, and they were determined to secure their own slice of the animation money pie. Strangely enough, though, one of the most renowned challenges to the Disney juggernaut during that period had been launched decades earlier by a couple of ordinary English blokes. They basically had started their business in a basement way back in 1972 and called it Aardman Animations, Ltd. It was the creation of Peter Lord and David Sproxton, two then-unknown animators living in Bristol, England. They started out using simple clay animation, then progressed steadily to more advanced techniques. 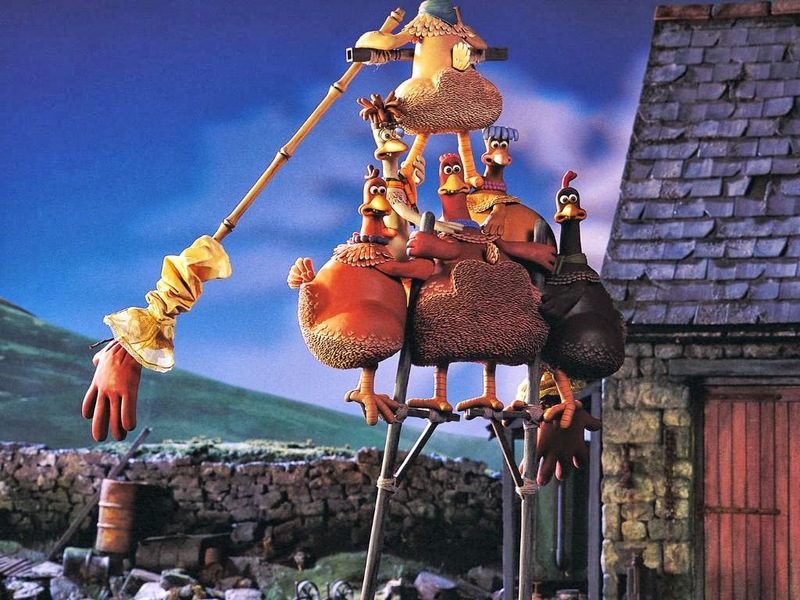 Today, Aardman continues producing quality material, some of it, to be sure, cutting-edge computer-generated animation, but also some created using earlier, simpler methods. Stop-motion animation, for instance, has been popular at least since the popular holiday television specials of the 1960s, but it remains an Aardman specialty. 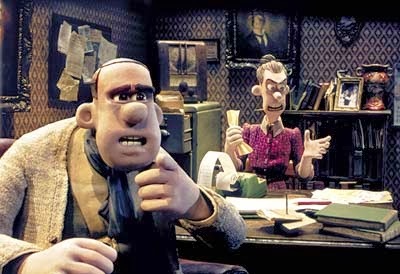 Aardman is most famous for a series of shorts following the adventures of Wallace and Gromit, a wacky pair of friends. Wallace is a naive English green-knitted-tank top-wearing inventor, while his sidekick Gromit is his knowing but silent dog. Some of the short films starring Wallace and Gromit are: A Grand Day Out (1989), The Wrong Trousers (1993) and A Close Shave (1995), the latter two winning Academy Awards. Anybody see a reference to "The Great Escape"? Seeking to capitalize on the growing popularity of Wallace and Gromit, Aardman decided to try its hand at a full-length animated feature film and compete directly with Disney. Katzenberg at DreamWorks signed on to finance and distribute the project, and the result was "Chicken Run" (2000), directed by Peter Lord and Nick Park with a screenplay by Karey Kirkpatrick, a stop-motion animation family comedy film. 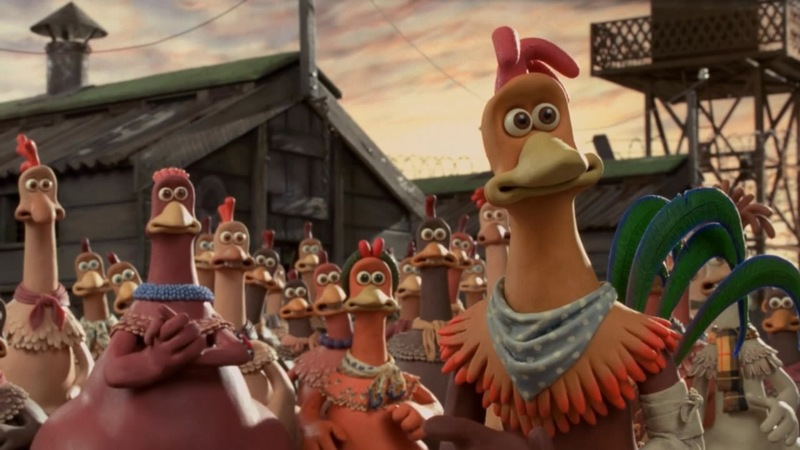 "Chicken Run" follows the Tweedys, a normal 1950s-era middle-aged couple who run a chicken farm in Yorkshire. Times are tough, and Mrs. Tweedy is intelligent but belligerent. Mr. Tweedy essentially follows her orders and gets things done. Everything is run by clockwork, with the hens required to lay a certain number of eggs daily or Mrs. Tweedy kills them. Ginger and the other chickens view the coop as a prison camp, and they are determined to escape. Nick and Fetcher are friendly rats who smuggle in black market goods to help with these escape attempts, but so far they all have been unsuccessful. Whenever Ginger is recaptured, she is sent to solitary confinement. Movie fans will notice resemblances to the set-up of the classic World War II film "The Great Escape." It also is replete with knowing nods to other prison-camp films such as "Stalag 17" and classic British-icsms from the World War II era. One day, Ginger meets a Rhode Island Red cockerel, Rocky, who somehow has gotten over the fence and into the coop. He is a circus rooster who is trained to jump in such a way that he appears to fly. Rocky doesn't like the circus, though, and Ginger agrees to hide him on the condition that if he shares his secret on how to fly. With an injured wing, Rocky says that he can't teach them right away, but that the other chickens have to exercise to prepare for their training. Mrs. Tweedy, meanwhile, latches onto a scheme to increase the farm's profits. She orders a mysterious piece of equipment, then doubles the chickens' food. Ginger fears that Mrs. Tweedy is trying to fatten the chickens up before using the new machine to kill them. Ginger warns the other chickens, but before Rocky can teach them how to fly, Mrs. Tweedy takes Ginger and prepares to use her as the demonstration case for the new machine - which is designed to make chicken pot pies. Rocky, however, sabotages the machine and rescues Ginger. Some of the other chickens who had doubted Rocky, such as Fowler, an old cockerel who is an air force veteran, now begin to respect him. There is a secret that Rocky isn't telling the other chickens, however: he actually can't fly, his performances having been possible only because he had been shot from a cannon. He escapes from the coop, leaving behind evidence of his treachery. This gives Ginger an idea, though, which is to build an airplane based on Fowler's knowledge and materials supplied by the two rats. It is a race against time to build the plane before Mrs. Tweedy fixes the pot-pie machine and seals the chickens' doom. When Mr. Tweedy enters the coop to start taking the chickens to the machine, they launch a revolt and capture him. A wild melee erupts, and Rocky returns after realizing the true danger the chickens are in. He and Ginger try to get the airplane working while Mrs. Tweedy tries to stop them. In the confusion, Mrs. Tweedy falls into the machine and destroys it, while the chickens make their escape. Rocky and Ginger fall in love, and the chickens establish a new home for themselves elsewhere. 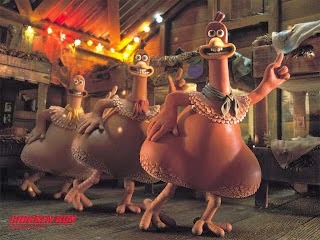 Most people who get the opportunity to watch "Chicken Run" seem to love it, just as they love the Wallace and Gromit films. There is a lot of slapstick comedy, interspersed with action and even romance. 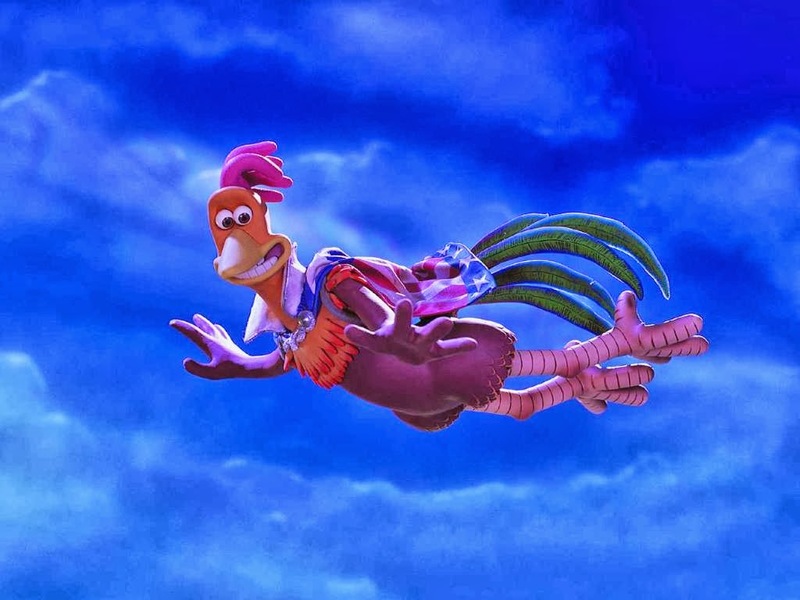 Perhaps the best thing about "Chicken Run," though, is that it is a high-quality animation feature film that has a feel and themes that no Hollywood studio could duplicate. 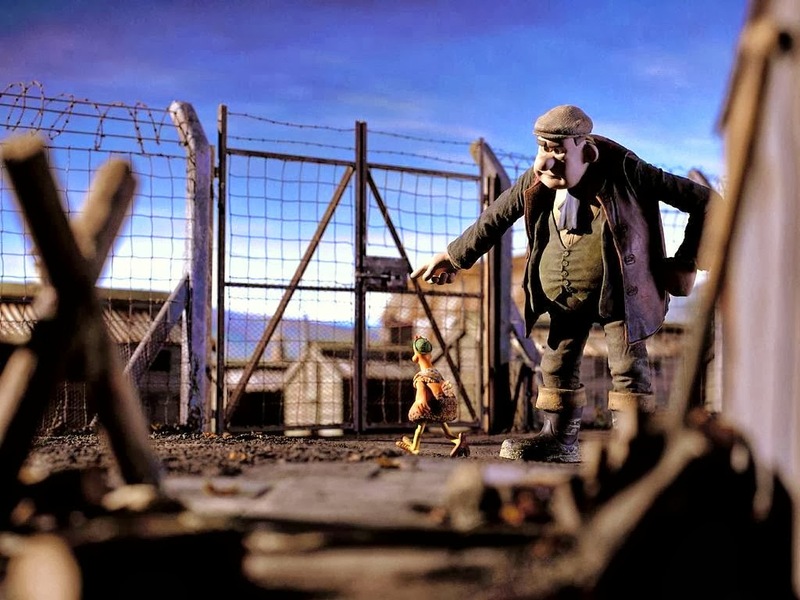 "Chicken Run" stands on its own, an alternative to the increasingly slick and, dare we say it, pretentious offerings of the animation heavyweights such as Disney, Pixar, DreamWorks and the rest. The cast is brilliant, and notable for featuring almost exclusively actors from the British Commonwealth. That includes Julia Sawalha as Ginger, Mel Gibson as Rocky, Miranda Richardson as the evil Mrs. Tweedy, Tony Haygarth as Mr. Tweedy, Benjamin Whitrow as Fowler, Timothy Spall as Nick and Phil Daniels as Fetcher. Harry Gregson-Williams and John Powell composed the soundtrack. 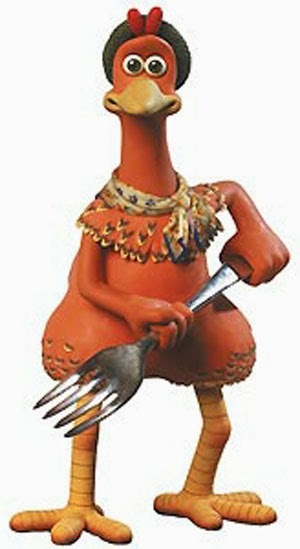 "Chicken Run" is not your standard Hollywood animated film. Stop-action animation is something Hollywood does not use much any longer, so it may seem foreign to eyes accustomed to standard offerings such as the "Toy Story" and "Shrek" sorts of films. 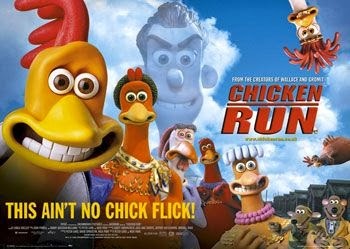 However, it is fun to have an alternative, and audiences agreed: "Chicken Run" was a huge hit at the box office, taking in $224 million on a $45 million budget. 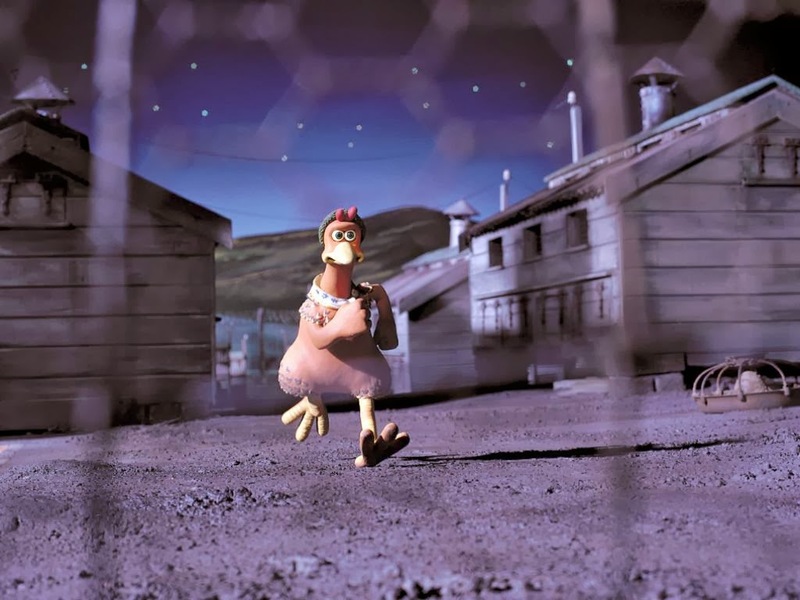 Perhaps the most surprising thing about "Chicken Run" is that Aardman hasn't succumbed to the lure of easy money and produced a sequel yet, as any Hollywood studio likely would have done years ago. 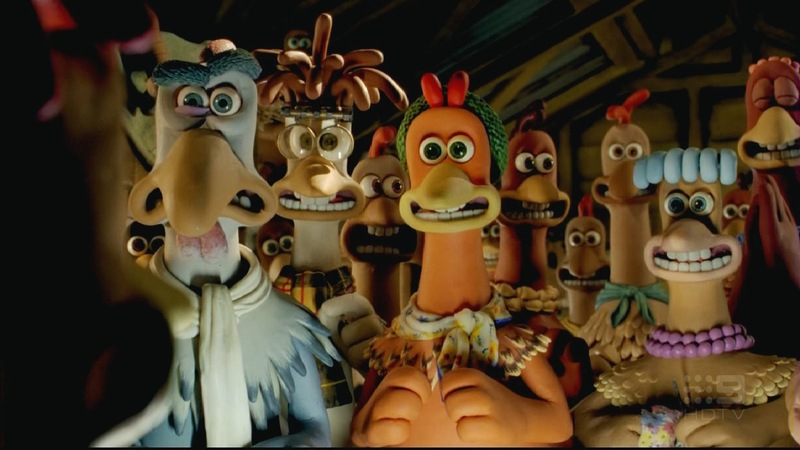 You don't have to be a fan of the stars or of British cinema to appreciate "Chicken Run." It is recommended for all animation fans. 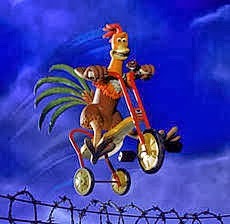 Below is the trailer for "Chicken Run."